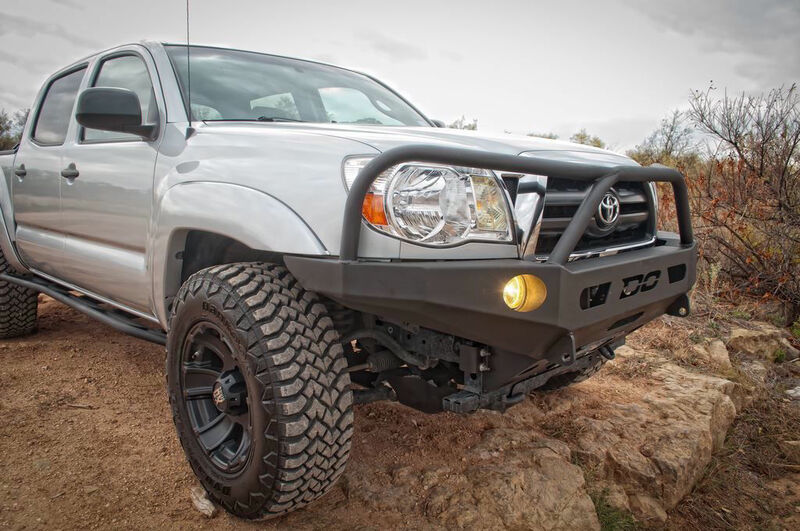 DeMello Off-Road Tacoma bumpers are second to none in strength and light weight construction designed to optimize ground clearance and light weight. The Squadron® Sport is hands down the best $119.95 LED on the market today. Although similar in aesthetics to the Squadron® Pro, the application for the Sport varies. The Squadron® Sport utilizes 4 Cree XP-G2 LEDs producing an impressive 1,800 lumens at 20 watts making it ideal for near field, side/backup and scene lighting application. An industry first 30 Day Satisfaction Guarantee & Limited Lifetime Warranty is included for the ultimate in purchase protection. Enjoy 4,300 lumens utilizing 4 Cree XM-L2 LEDs! The Squadron-R Pro’s light weight and powerful capabilities make it the ideal companion for all of your late night off-roading adventures! Relish high-performance and durability with nearly 50,000 hours of auxiliary LED light, optimized for a more traditional LED experience and aftermarket bumper featuring a 4” round hole. As always, Baja Designs offers a 30 Day Satisfaction Guarantee & Limited Lifetime Warranty. verall dimensions: (L x W x H) 22.3 inch x 5.4 inch x 9.4 inch. 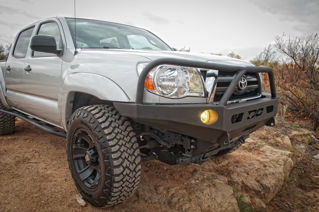 DeMello Off-Road Aluminum Tacoma bumpers are complete bolt on and feature 1/4in winch mount construction directly tied into a 1in thick frame mounting system that goes from the top of the inside of the bumper to the bottom. This design also is part of the one piece shackle design all our front bumpers now have. The bumper is also cross braced with 3/16in skeleton that keeps the designed light but strong. The skin of the bumper 3/16in plating for a durable but light weight construction. We also use a all new frame capture bracket that clamps the bumper to the frame to ensure a solid mount. This bumper features a 3 hoop design offering the best protection possible for your head lights and grill. Light weight high clearance construction rounds off this bumper. All our plate bumpers can retain any non-integrated winch up to 10,000 pounds. The fog light holes in the bumper are 4 inches in diameter. We recommend using Acro A3840's 3-3/4 inch LED lights. Or the Baja design lights. Aluminum bumper weighs 55lbs and ships Freight due to size. Please contact us for lead times 951-735-4417 expect a 6-8 week lead time. Please note: Bumper will be shipped freight additional shipping charges will applied when ordered. Please call for actual ship date before ordering. Note: some pictures show options not included. Please note, that powder coating is an option and holds no warranty from defects and damages. It will not protect the bumper from scratches, rust, trail damage, street damage or other. We do our best to ship the product to you with out damage to the powder coating but it has no written or other warranty. All shipping damage needs to be addressed with shipping company, DeMello Off-road assumes no responsibility for shipping damage. Please note: Factory fog lights do not fit with our aftermarket bumpers. We offer several different options for them. DeMello Off-Road Dominator sliders are a unique alternative to the traditional sliders on the market with boxed reinforced front and rear end they offer extra protection in front and a step in the rear to enter your bed all while maintaining a out of the way but there when you need them approach to rocker panel protection on and off the trail.